Hipparchus of Nicaea (/hɪˈpɑrkəs/; Greek: Ἵππαρχος, Hipparkhos; c. 190 – c. 120 BC), was a Greek astronomer, geographer, and mathematician of the Hellenistic period. 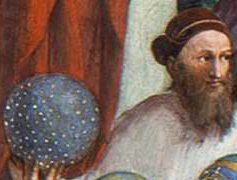 He is considered the founder of trigonometry but is most famous for his incidental discovery of precession of the equinoxes.Hipparchus was born in Nicaea, Bithynia (now Iznik, Turkey), and probably died on the island of Rhodes. He is known to have been a working astronomer at least from 162 to 127 BC.